Valentine, I'm Wild About You!! 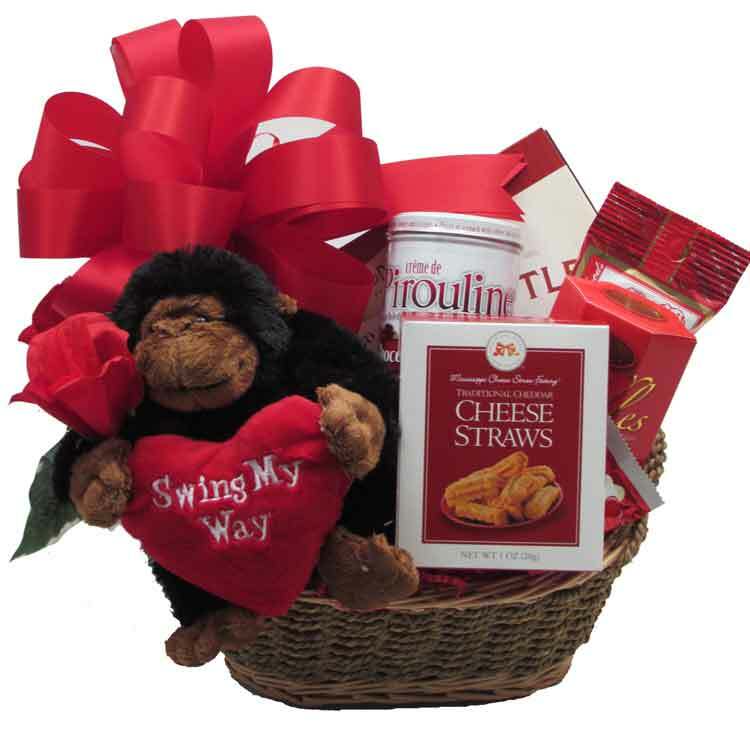 This basket has a cute Plush Gorilla that is holding a red plush heart that says "Swing My Way!" In the basket: The Plush Gorilla is 6"H Measured sitting. We add beautiful silk roses & greenery to the design to celebrate the occasion! Wrapped in crisp cellophane and topped off with a red handmade bow. Includes a Handwritten Greeting Card. Finished wrapped design for delivery is approx. 15"H x 11"W x 8"D. Add balloons for $2 each. MORE SWEET THAN SAVORY - We put in Russell Stover's heart shaped box of Assorted Chocolates (not in the photo) for the Valentine's Day event! Also included, Cheese Straws, Nuts, tin of Chocolate filled Wafer Rolls, and a box of Peanut Brittle. A BIT MORE SAVORY THAN SWEET - We of course include Russell Stover's heart shaped box of Assorted Chocolates, Cheese, Nuts, Natural Hickory Smoked Sliced Beef Summer Sausage, and a box of Focaccia Crisps Crackers. NOTE: We are out of this particular basket, but will substitute with another.